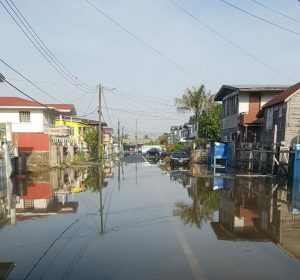 Residents of River view and Alexander Village, Georgetown on Wednesday woke up to flood waters inundating their yards, dwellings and businesses. 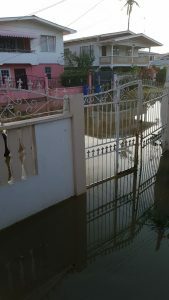 Sources said the flood started at about 3 AM during Demerara River high-tide. The exact cause of the flood was not immediately known. There are two different accounts- the koker operator slept away and the koker malfunctioned. City Engineer, Colvern Venture said investigations were underway to determine the cause and that the media would be informed later Wednesday. He said the water was receding. This is not the first time that area has been flooded due to problems with the koker.